It was Wednesday, while the EDSA was busy, we were six, we met at Victory Liner terminal in Kamias. Before departure: water check, jacket check, groupie check an diatabs check na check! All set! Our departure was at 7:45 PM but our tickets were already reserved five days before our adventure. Having a relaxing ambiance inside the bus while traveling has been provided by Victory Liner, thus, we had an ample time for sleeping. Though, there were several stop over where you can stretch your bones and muscles, eat and use the toilet. Our estimated time of arrival in Tuguegarao City was 6 AM. Had a toilet break then walked on the street looking for a place for a sumptuous breakfast. Found a carinderia beside the Brickstone Mall. Then, proceeded to the UV Express terminal at the back of Brickstone. Rode in the van bound for Sta. Ana (250 pesos). Travel Time: 3 to 4 hours. Alighted at San Vicente fish port and met Kuya Mark, our boat man. Settled the boat fee: 3,800 pesos for four destinations at PASAMOBA office, beside the port. Had our lunch first and proceeded to our first destination in Palaui Island. Kuya Mark can be contacted on 09759869110. Our first destination was the historical Cape Engaño Lighthouse and the Mabolbol Shore, an hour travel from San Vicente port. From afar, the long stretch our white sand shoreline is visible. Though, the waves were strong, our boatmen were able to manage to dock by the shore. Then, a guide welcomed us with a smile. Registered and paid the necessary fees while on a halo-halo break. Upon arrival at the base of Cape Engaño Lighouse, I was stunned by its structure. The tower and the walls are made of thick concrete with an artistic design. 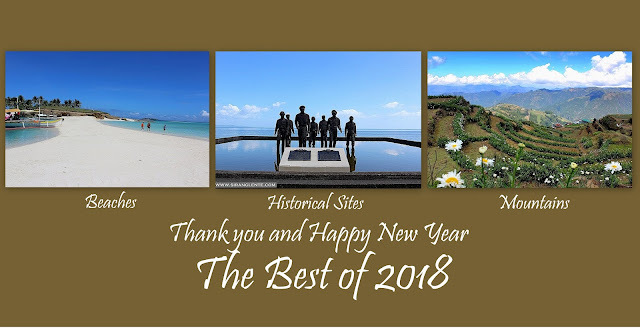 According to the historical marker, it was initially designed by Engineer Magin Pers y Pers who also designed Cape Bojeador Lighthouse in Burgos, Ilocos Norte and Capones Lighthouse in Zambales. However, it was continued by Guillermo Brockman who designed the Capul Lighthouse in Northern Samar and behind the completion of some lighthouses in the Philippines. 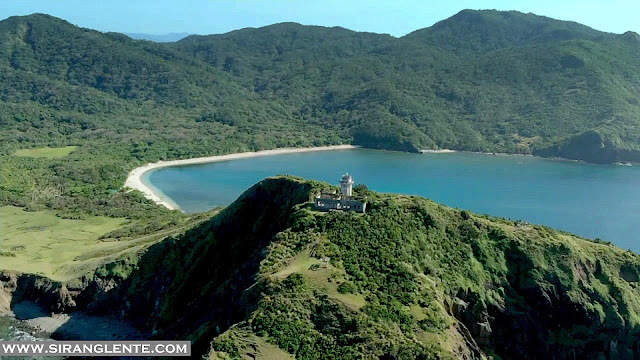 The construction of Cape Engaño Lighthouse started on 21 September 1888 and was completed on 31 December 1892. Like other lighthouses, its primary function is to serve as a guide to the sea vessel navigators who are crossing the Babuyan Channel. According to Jamorabon family, who served as the caretakers for a long time, the name Engaño was given by the Spaniards because they were stunned by its natural beauty when they first set their foot on the cape. Today, it is still serving as a guide to the seafarers and local fishermen. On the tower, there's a spot where Dos Hermanas Island can be seen that serves as an amazing backdrop. We left the lighthouse at around 4:30 PM and proceeded to Crocodile Island. The side view of the Crocodile Island. You are correct! It is very self explanatory. Its name, Crocodile Island, was derived from it shape. It is a rock formation that looks like a crocodile from afar, that's it! During high tide, the islet is surrounded by water and is being hit by the waves, but on low tide, the white sand surrounding the islet appears. After the photo ops on Crocodile Island, we proceeded to Punta Verde to met Ate Elsa. Ate Elsa is the most prominent individual in Palaui Island and her house provides a homestay, where we spent overnight. Upon arrival, Ate Elsa greeted us with a warm smile and proceeded to our room. The rooms at her houses are spacious and ventilated, however, there's no electricity in the island, thus, locals use generators. We rested for a few minutes and then tidy up. No worries, there are toilets and the faucet has unlimited cool water free flowing from the spring. It was 8 PM when we had our dinner and then social and slept. Good Morning!!!! It was our second day. The air was fresh and cool. Tidy up and packed our things up for our next destinations - the stunning Anguib Cove. But before that, we enjoyed the breakfast served by Ate Elsa. We made paluto our dinner and breakfast. Ate Elsa can be contacted on 09052832559. 250 pesos for an overnight stay. After breakfast, we settled the fees and proceeded to I Love Palaui signboard, a few meters away from Ate Elsa's house. Departed Punta Verde and headed to Anguib. Travel Time: 45 minutes. It was high tide, instead of the short cut route, our boat pass through the mangrove area (photo above) and passed by a private resort owned by a senator. Then, we were astounded and welcomed by a long stretch of white sand shoreline. A drone shot by Henry Tan. Anguib Cove is not part of the Palaui Island, it is already part of the mainland of Sta. Ana. 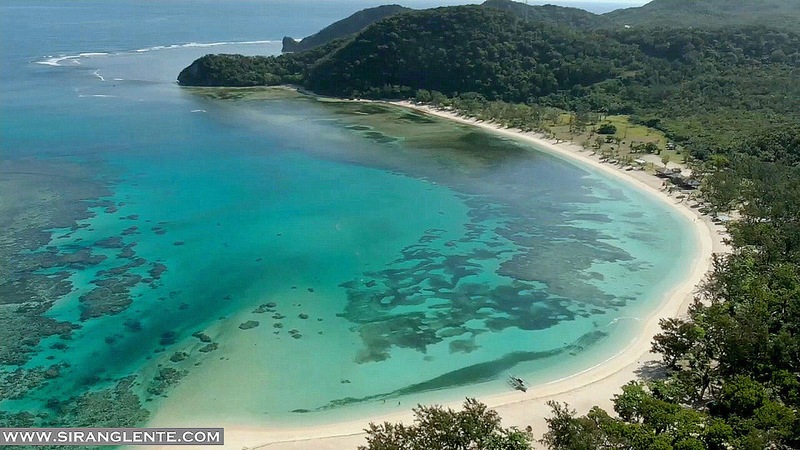 As showing on the drone shot, Anguib has long stretch of fine white sand shoreline, surrounded by greens and a crystal clear water. Its breathtaking and untouched beauty is a proof that it is definitely the "Boracay of the North," has a healthy competition with Pagudpud. Upon arrival at Anguib Beach Club, we paid the day tour entrance of 150 pesos at stayed at one of the cottages. Our visit was a Friday, thus, there were minimal tourists in the area and we enjoyed its relaxing ambiance. Anguib Cove, in general, is perfect for an island retreat and picnic by the beach with friends and family. There's an abundant crustaceans and colorful corals on the shore. Toilet and baths are available. Anguib Beach Club can be contacted on 09179888964 and 09178764079. For boat rental, contact Kuya Mark on 09759869110. After catching a glimpse of the hidden beauty of Anguib Cove, we headed back to San Vicente port, in Sta. Ana because Kuya Dany, the UV Express driver, was waiting for us. We're not done yet, it was lunch time, instead of heading back to Tuguegarao City, we stopped by the DAMPA in centro for a life changing lunch. Then, back on the highway to the city for our next destination - the Callao Cave. We alighted in Petron, not sure, or maybe Caltex, near the Victory Liner terminal. We rode in a tricycle to a tricycle terminal bound for Callao Cave in Peñablanca. The travel time was 45 minutes on a long winding road. We left our backpacks at the souvenir shop by the jump off. Walked and rode on a motorized boat crossing the river (short distance). By the entrance, we met Kuya Gary, our guide. He fed us with a lot information and he's good in taking photos inside the cave. He knows where, when and how to get a perfect photo. Callao Cave is a seven chamber cave located in Peñablanca, Cagayan. Peñablanca is a Spanish word which means white rocks because of the limestone present in the area. This cave is situated on the Northern foothills of the Sierra Madre Mountains. Did you know that a 67,000 years old fossilized remains of Callao Man was discovered inside the cave in 2007? Thousand years older than the Tabon Man. After discovering the gigantic cavern of the Callao Cave, we headed back to the jump off and shopped at the souvenir shop. The long un-concrete road doesn't have street lights, therefore, my heart did not stop pounding every time there's an uphill, downhill and turn. We alighted in front Hotel Joselina, the cheapest hotel in Tuguegarao. Checked in. Rested. Tidy up. Everyone was up and ready. We asked the guard and the receptionist for the best restaurant serving the best Pancit Batil Patong, a local, prominent and a must tried delicacy in Tuguegarao City. Walked on the streets and by asking the locals, we found CHONG'S PANCITERIA located at Centro 10 Riverside near the Barangay Hall. They serve the best and mouth watering homemade Pancit Batil Patong in Tuguegarao. For inquiries, you can contact Ate Roan on 09366668440. CHONG'S PANCITERIA is a walking distance from Hotel Joselina and Tuguegarao Cathedral (photo above). Aside from Palaui Island and Callao Cave, Tuguegararao Cathedral is one of the faces of Cagayan province. This cathedral is an 18th century baroque church. It was originally built by Domicans friars 1761 to 1767. The structure was heavity destroyed during the second World War and was rebuilt by Monsignor Bishop Constance Jurgens. We walked on the streets again, bought coffee at McDo and headed back to Hotel Joselina. Then, socials and rested. The next day, it was a caving adventure in Lussok Cave, Luna, Province of Apayao.